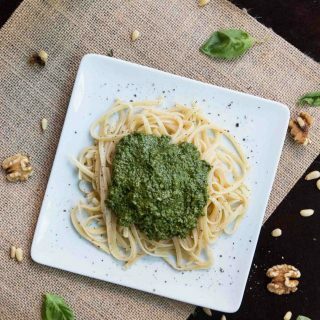 There are some sauces you just can’t live without, and for me, that’s this simple Vegan Pesto Recipe! It contains the perfect blend of ingredients and is a staple in my freezer! It’s very versatile and can be used to enhance many different dishes! The list could go on-and-on. Simply put, I love any and all types of pesto combinations. One of my favorites is my Sun-Dried Tomato, Miso, Basil Pesto if you want that additional umami flavor. My Broccoli Pesto is great if you need a sneaky way to get those veggies in! Using a variety of different nuts and herbs/greens is always fun, especially when you’ve run out of one of some ingredients and need a substitution. The Parsley Cilantro Pesto brings a nice earthy flavor into the mix, and the Avocado Pesto comes out nice and creamy and contains those healthy fats. Again…the list of Pesto combinations could go on-and-on. As much as I love ALL of these different types of pesto combinations floating around out there, I often find myself coming back to this simple traditional recipe consisting of basil, olive oil, and garlic as the base. There’s just still something about this simple combination the combination that gets me every time. I used to add in parmesan cheese in my pre-vegan days, but ever since becoming vegan 3 years ago, I’ve found my own perfect traditional combination of basil, garlic, olive oil, a mix of pine nuts and walnuts, salt, freshly ground black pepper, and a squeeze of fresh lemon juice. You can easily use all pine nuts if you prefer, but I love the slightly sweet, nutty flavor of walnuts. Not to mention, out of all the nuts, walnuts are my kids’ least favorite but one of the most nutritious, so I love sneaking it into the pesto sauce. My family couldn’t even tell the difference with this vegan combination. You’ve seen me post about it constantly, and now you’ll hear me say it yet AGAIN…make a HUGE batch of this vegan pesto and FREEZE it! It’ll be the best thing you could do for meal prep! And when I mean huge, I mean making 10-12 oz. of basil worth of pesto. Since it contains olive oil, it freezes and defrosts really well. Plus, in my mind, if you’re going through the trouble of pulling out all the ingredients and dirtying up your blender or food processor, why just make a small batch? It’ doesn’t require much more effort aside from peeling all that garlic (btw you can also buy pre-peeled!). These airtight freezer containers are my absolute favorite and I’ve been using them for years. If you’re looking at me thinking…HA…now why would I go through the trouble when I can simply buy ready made pesto from the store?!?! 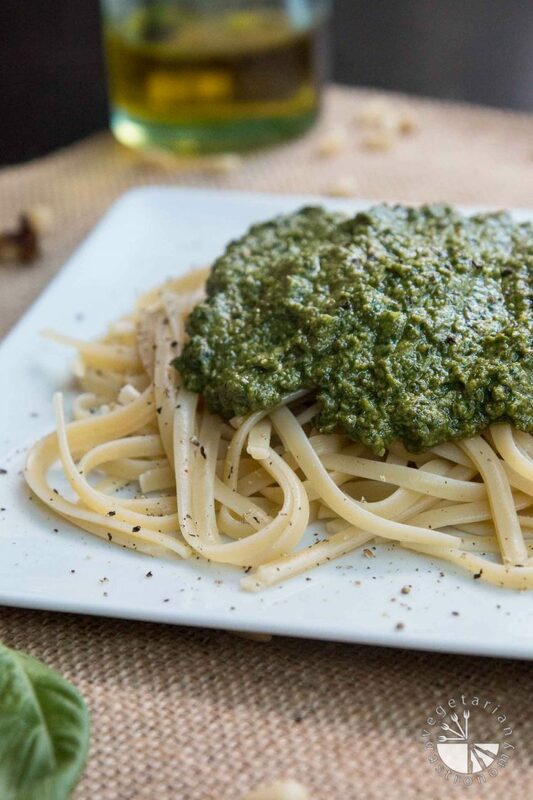 And to all of you, I’d ask…have you ever tasted FRESHLY made pesto vs. store bought?? It’s SO much better when made at home, contains no preservatives, and is cheaper, especially if you can find basil in bulk, and use walnuts in addition to pine-nuts. So there you have it. 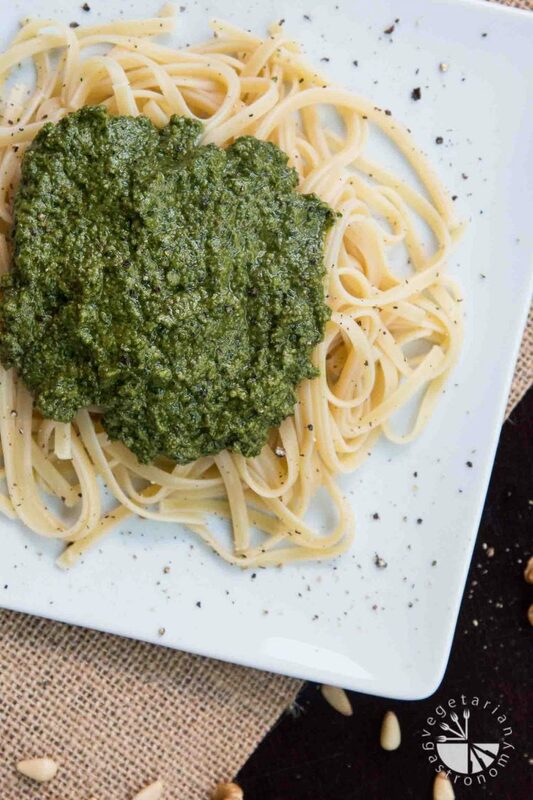 Try making this fresh traditional Vegan Pesto Recipe at home, and I promise you won’t go back to the store-bought version. I have another awesome recipe coming up for all of you using this vegan pesto recipe, so make a batch today and be sure to freeze it! Add all ingredients into in a food processor and blend completely. Add additional fresh lemon juice, salt, and freshly ground black pepper to taste. Enjoy it as a dip or spread, over pasta, or freeze it for quick meals! If you are freezing the pesto for use at a later time, add a very small layer of olive oil on top of the pesto in the freezable container to preserve. The nutrition information is per 1 cup prepared pesto. Thanks Rashmi! It' so so easy to make and home and tastes much better than store-bought! Plus it freezes well and makes for a great quick meal! Pesto is always my go to when I have a ton of herbs to use up! Love using different herbs, although i do have to say the basil is still my fav version. you'll love this simple classic combo!! How are you so well versed in so many different types of cuisine?? From the spicy curries to the stir-fries and now I'm realizing you are quite the pesto pro too! So many different bases and flavor options around here already, which is one of the things I love about pesto too. But the garlic + basil + olive oil classic combo is a classic for a reason--so good. To be honest I've never really known what made pine nuts so special to be worth their pricey-ness, so I'm glad you went half and half with the walnuts too :) Mmmm that deeply delicious green color, I am totally craving a big bowl of pesto zoodles now! Your last craving is exactly my next recipe i'm hoping to post soon!! I love pesto for that exact same reason...so many different combinations, all so different and all delicious! But yes...that garlic basil olive oil combo is still a classic i can't ignore =) I actually love pine nuts in pesto, but yes...they are SUPER pricey, and once i started adding 1/2 walnuts, the combo was awesome! Slightly sweet, and great way to get walnuts into my kids who otherwise will not touch them ha! Thanks so much Natalie! Now I can't wait to share the pesto zoodles recipe! I love pesto, too! You are so smart to freeze it. I need to start doing that. Thanks for the tip! You are so right. I love having pesto as a staple in my house. Love the recipe! Isn't it so easy and versatile!!? Thanks Kelly! I love pesto! It's so easy to make and filled with so many healthy ingredients. This looks great. This looks fantastic! 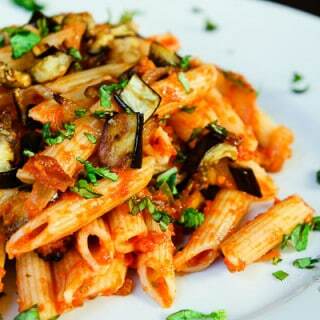 I'm a HUGE fan of pesto...and I loved all the other recipes you linked out to on your site! I have never thought to freeze it! I'm so doing that on my next batch!! Thanks Amanda! Me too...and love all the other versions as well! 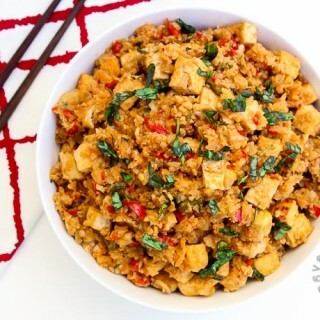 I've been freezing it for awhile now...it's perfect for quick meals or additions! Gorgeous vegan pesto, so great that you can make a big batch and freeze some ready for quick mid week meals. I just bought some basil, now I know what I am going to do with it! Love that you have kept it classic and simple. I will never tire of pesto, it is such a convenient sauce for all kinds of wonders. Love it. Great to have a vegan version. 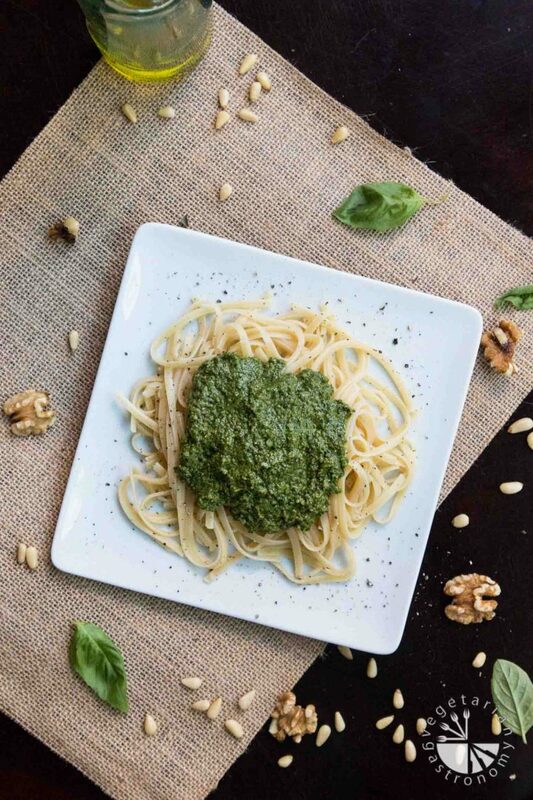 I absolutely LOVE pesto and am loving your vegan rendition of the kitchen classic! Will have to try this recipe out this weekend when I make my next batch! Thanks Sarah! hope you enjoy it! Having a go to pesto is a must! I love making giant batches and freezing it to pull out on those crazy nights! Yes...pesto in the freezer has definitely saved me so many nights ha! I love a good pesto and this looks really great! I have never thought of freezing pesto, great tip, btw! Pesto freezes SO well! I always do it after making huge batches of it at once! Those freezer containers are my favorite as well. made this tonight and it's beautiful! thank you so much for the recipe!! So funny...i just made another huge batch for dinner tonight as well! thanks so much for trying it out! Try my sun-dried tomato miso basil pesto next! Pesto was very easy to make and testy. I use it all the time. 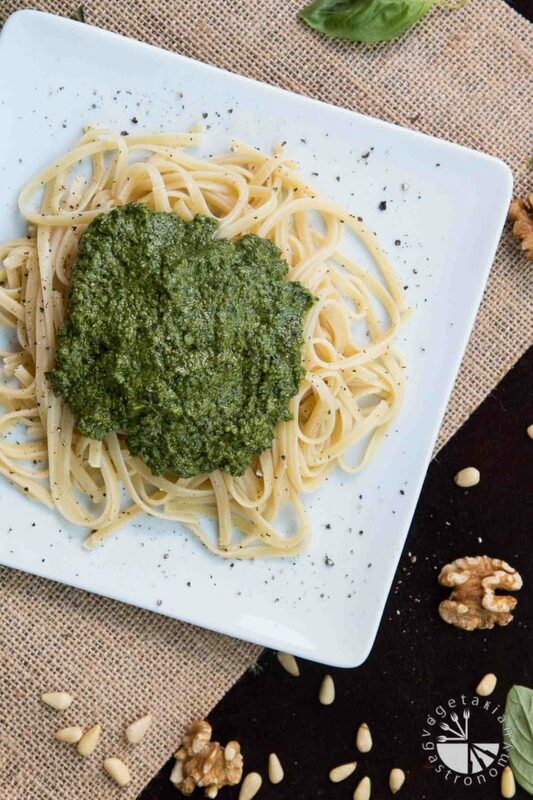 Vegan pesto recipe is incredible! What would you suggest if : No pine nuts at home because my husband is allergic. 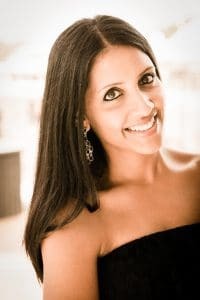 Thx for sharing Anjali! For a nut-free pesto, I can think of a few options. Either omit the nuts completely and maybe add a little nutritional yeast for added flavor. Or make an avocado basil pesto (add in avo and omit nuts), add in some pepitas or sunflower seeds (smaller amount though). Or maybe a combination of the above. And check out my miso sun-dried tomato pesto recipe as well...it has more flavor in it! Hope that helps! Hi! If you look at the recipe, it states 2 cups of pesto for the recipe. I honestly make as much as I can...sometimes 12-16 oz. of basil worth of pesto and freeze it. Hope that helps! Let me know if you try it out!